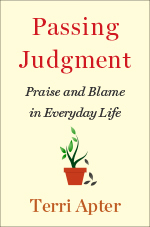 Passing Judgment: The Power of Praise & Blame in Everyday Life. Featured in Time.com and Newsweek.com: Breaking new ground in family psychology, an exploration of the intricacy, friction, and love in the bonds between in-laws. 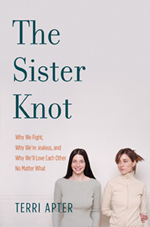 The TLS describes this as “a fascinating study of sisters… Apter brings vividly before the reader the complicated emotions, motives and behaviours involved in sistering… The Sister Knot has enormous explanatory value, both for those who have sisters and those who do not.” The Sundays Times critic wrote: Lucid, funny and enlightening. You Don’t Really Know Me! Her most recent book on teenage girls and their mothers (featured in May 24, 2004 issue of People Magazine as the Buzz Book) is You Dont Really Know Me!. 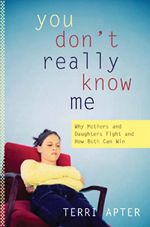 This takes a fresh look at mother/teenage daughter conflict. Writing in The Independent on Sunday, Marina Cantacuzino remarked, Terri Apter’s book is both a balm for my savaged feelings and a useful compass in this maze. You Dont Really Know Me! was also the basis of an editorial in the Guardian, the lead story in the Review section of the Independent on Sunday, as well as op-ed pieces in the Times, the Glasgow Herald, the Toronto Star and the Boston Globe. 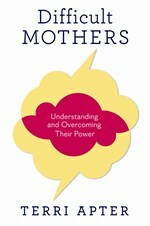 Publishers Weekly wrote that this is a convincing, well-written and truly helpful guide…Here is a book that takes the vagueness out of the notion of self-esteem and suggests concrete ways for parents to help their children like themselves and feel confident about their abilities to deal with the world around them. Winner of the International Educator’s Prize awarded by the Delta Kappa Gamma Society. 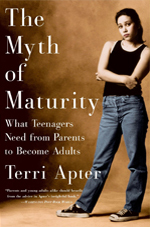 The Myth of Maturity describes the difficult transition between adolescence and adulthood. 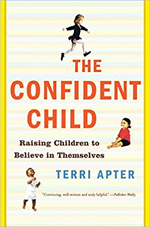 In this book Apter coins the term thresholders to identify young people who are legally adult,but stuck on the threshold of adulthood, held back by a range of social forces and unrealistic expectations. The research published here has been the subject of several conferences, reports on student welfare and public policy initiatives on supporting young people during the transition to adulthood.